Stories influence every facet of modern life, and in our attention and automation driven economy, they’re more important than ever when you want to reach an audience. Luckily, humans are evolutionarily hardwired for story. Since the birth of language, storytelling has been central to our progress. For thousands of years, before the birth of writing, stories passed down time-tested wisdom from generation to generation in songs and epic poems. Without a story, it’s almost impossible to spark imagination. Stories train our brains to envision solutions to our problems, and civilizations were built on our ability to do just this. So what makes your story memorable? Perhaps all stories are somewhat unique — depending on who’s telling them and how — but great stories all share a common DNA. There is a vital core to great storytelling, and it often involves a blueprint. Every screenwriting instructor will tell you this. A high school chemistry teacher and his family are barely scraping by on his meager salary. Their son has cerebral palsy and they become pregnant. When he is diagnosed with a terminal lung cancer, he faces an ethical dilemma out of necessity. Should he turn to a life of crime to both feed his family and pay for needed medical treatments the family cannot afford? A college track coach, frustrated by a lack of proper footwear available to his athletes, and inspired by a promising sprinter, turns to pouring rubber into a waffle maker to try to make a better running shoe. His early attempts fail, he burns himself, and he glues the waffle maker shut a few times, but he never gives up. He perseveres to create a homemade solution he initially sews to the bottom of a pair of shoes. His runners’ first tests of the shoes are like they are shot out of a cannon. From selling the shoes out of the trunk of a car, to launching his own line of footwear on two coasts, his “waffle” shoes go on to be worn by superstar athletes the world over. At a very early age, a little boy witnesses the death of both his parents by a criminal in a mugging gone sideways. He grows up to be an influential billionaire industrialist, and secretly trains himself to become a feared, crime-fighting vigilante, and protector of the weak. In a city of exponentially growing corruption and crime, he embodies hope for a population with little to spare. Alright, so if you had your pop culture detector on you probably guessed each of the wildly popular stories above. The first, considered “one of the best television shows ever made,” is the inciting event of Vince Gilligan’s Breaking Bad. The cult hit earned 16 Primetime Emmy Awards and 58 nominations, a Guinness World Record as “the most critically acclaimed show of all time,” and had an unprecedented 10 million viewers for its finale, making it one of the most watched cable shows in America. The second is the condensed origin story behind the mega-brand Nike, Inc. Their story is the backbone of the world’s largest supplier of athletic shoes and apparel, and it’s used as a company lodestar. In fact, Nike has a culture of storytelling in their business model. They teach their story to every employee, a literal cult of innovation. The third is the timeless story of “The Dark Knight,” aka Batman, a multi-billion-dollar comic book character franchise built solely on the imaginations of a handful of dedicated artists and writers. What helped turn these simple stories into franchises and enduring brands? They stick with us because they tap into the core of what makes us human. Neuroscientist Michael Grybko and I discussed the research behind great storytelling on The Writer Files podcast, including: how empathy makes storytelling such an effective tool, why Hollywood continually taps into the hero’s journey, and how blueprints help writers connect with their audiences. Remember that markets are conversations, and conversations are traditionally between two human beings in a natural tone. What makes us remember or share a conversation is empathy, shared emotion, and our mind’s ability to truly sync with the storyteller. It’s why TED talks are slightly more engaging than that info-dump you get from the cold-call kid trying to sell you modern windows for your historic house. In Five Stars: The Communication Secrets to Get from Good to Great, author Carmine Gallo references the work of a research team at Princeton using fMRI brain scans to study subjects engaged in storytelling. Their research showed that as a story was told, listeners’ brain waves synced to each other, and with the storyteller. Mirror neurons allow us to become a part of the story fabric, and Mr. Grybko reasoned that we evolved this way because it’s the most effective way humans impart knowledge to one another. Conclusion: Storytelling is like a flight simulator for life, but for it to be effective it needs to be believable, conversational, and carry an emotional weight. We are all competing with the same day-to-day cult of busyness and barrage of digital infotainment. Research will help you get to know your audience intimately and understand the mood they’ll be in when they find your story. Then study the great storytellers of our age. You no doubt already have a pretty good head start if you read fiction or watch Netflix. Think like a screenwriter, a TV writer, or a serial thriller writer. If you treat your content as a serial your readers can find and binge — like a tentpole movie franchise, an addictive TV show, or a suspense novel series — you can grab and keep their attention. These three simple models will help guide your way toward storytelling success. Take a page from a small, but incredibly talented, four-person motion graphics company from the late ’70s. It was originally called the Computer Graphics Lab (CGL) but became famous via Lucasfilm, and is now known as Pixar. One of Pixar’s own Story Artists shared the company’s 22 Rules of Storytelling, which went viral on Twitter. You could cherry-pick any or all of the rules to add gravity to your own stories. Pink made a great video on how to put it into action here. As a fan of the cult hit Community by controversial TV writer and showrunner Dan Harmon, I’ve written about my take on his intuitive method for writing the show that you can apply to most story-centric content. “The main character finds himself/herself in a comfort zone (ordinary life). They want something (to satisfy their desires or solve a problem). They enter into an unfamiliar situation (a call to adventure). They must adapt to it (and overcome resistance, objections). They get what they wanted (a mentor appears to guide them and provide the key to solve their problems or satisfy their desires). But have to pay a price for it (the call to action). The TV producer has applied his story algorithm to almost every creative project he’s worked on and it has earned him a huge cult following and a recent Emmy award for his animated series Rick and Morty. It’s hard to ignore heavyweight author Elmore Leonard’s 10 Rules of Writing, from his book of the same name. You may remember some of his best work including: Get Shorty, Out of Sight, or Rum Punch (adapted into the movie Jackie Brown). His short stories were adapted into films too (3:10 to Yuma, The Tall T) and I was a huge fan of his FX TV series Justified. The line of dialogue belongs to the character; the verb is the writer sticking his nose in. But “said” is far less intrusive than “grumbled,” “gasped,” “cautioned,” “lied.” I once noticed [a writer] ending a line of dialogue with “she asseverated,” and had to stop reading to get the dictionary. He “admonished gravely.” To use an adverb this way (or almost any way) is a mortal sin. The writer is now exposing himself in earnest, using a word that distracts and can interrupt the rhythm of the exchange. Unless you’re Margaret Atwood and can paint scenes with language … But even if you’re good at it, you don’t want descriptions that bring the action, the flow of the story, to a standstill. “Perpetrating hooptedoodle” is likely to be the best phrase I’ll read this week. Haha, truly a pleasure 😉 Is it a real word? Hi Kelton, I loved this one – Keep your exclamation points under control. I have a few contributor and ghost writers that tend to use a lot of them and I’ve had to cut a few. I did it naturally not knowing my reasoning behind it but you clarified that for me here, thank you! I was happy to also read to “not go into great detail and skip the part that readers won’t read.” I tend to me a short and sweet writer but I do need to get better with telling stories. This post was very helpful. Thank you Kelton! Thank you Lisa, I’m happy you found it useful! Not more than 2 or 3 exclamation points for 100.000 words? Geez! Does that mean, I need to rebuild all of my previous work? I don’t think you need to worry about it unless you’re writing a novel 😉 But it’s good to keep an eye on frequency. Worth reading. Storytelling is the best way to engage and communicate with an audience and build a meaningful approach. This probably is the best article on Storytelling I’ve ever came across; excellent work, buddy! Great to hear Romario, thanks! Great post Kelton. 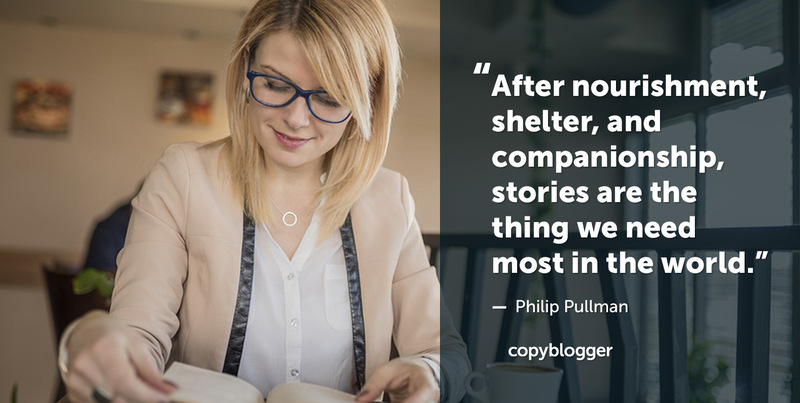 As a copywriter and author, I know exactly how powerful storytelling can be. How it can alter lives and alter people’s perceptions. Thanks for sharing. Writing a movie’s story is difficult, writing a good series of stories is even more difficult. But if you do it well you can keep getting people back for more, which is really powerful.